Sheran geared up & ready for the 1 st dive of the PADI Junior Advance Open Water Diver Course in Trincomalee. 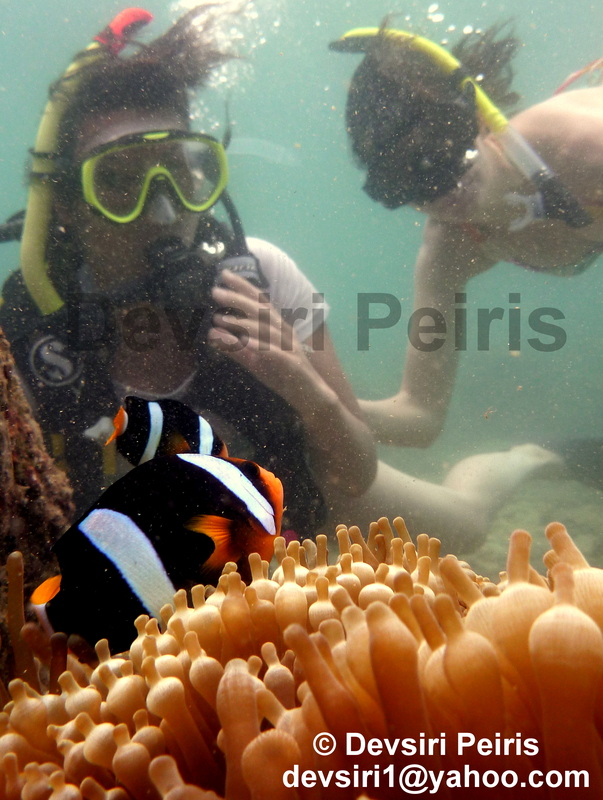 Sheran is 12 years old & hopes to become a marine biologist when he grows up. 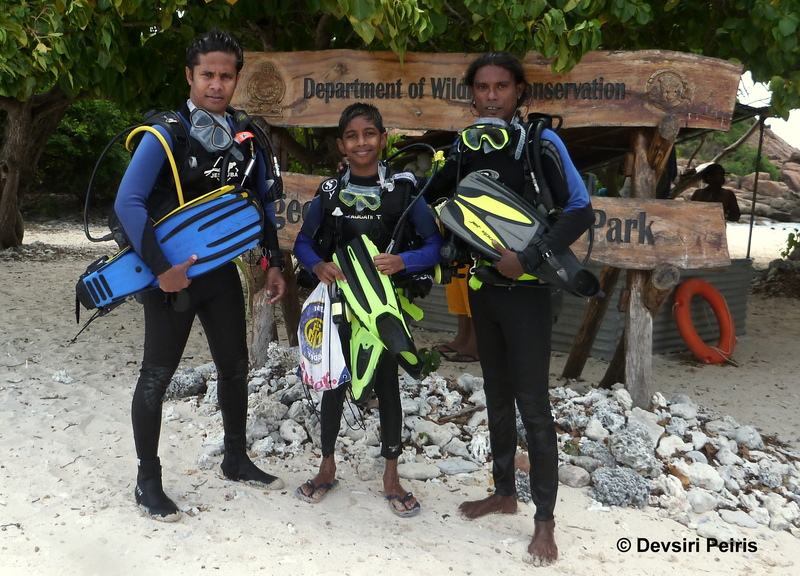 He was very keen on fine tuning his Buoyancy skills in order to improve his diving & also to be a responsible & environmentally friendly Scuba diver. Well done & congratulations on becoming a PADI Junior Advance Open Water Diver. Diving is for everyone! there is an amazing world down there waiting for you! Everyone knows that being dehydrated is bad in general! Do you know why it’s important to scuba diving specifically? Do you know how scuba diving itself dehydrates you faster than many other activities? Do you know the symptoms and what to do about it? If you do, great! If you’re still unsure, then this article is for you. How Does Dehydration Affect Scuba Diving? To put it simply, dehydration predisposes divers to decompression sickness. (DCS) When the body is dehydrated, the blood thickens. The slower, thicker fluid makes it hard to transport necessary nutrients and exchange gasses. This diminished capacity for gas exchange is what directly affects scuba divers and increases risks for DCS. If the thickened blood can’t adequately exchange gasses, then it can’t adequately off-gas nitrogen. So even when diving within the limits of the tables or a computer, the dehydrated diver is at a greater risk. This isn’t the only issue for scuba divers, though. Dehydration causes other physical side effects that can directly contribute to diver safety: muscle cramping and fatigue, increased heart rate and blood pressure, and confusion. None of those things are helpful to divers and all of them can lead to exhaustion, reduced air consumption, and poor decision making. Most of us know how dehydration happens at a basic level: You lose more water than you put in and you end up dehydrated. Simple, right? People think about hydration when they’re heavily exerting themselves and sweating profusely. But those things don’t happen all that often while scuba diving, so what makes divers dehydrate quicker than normal? How does it sneak up on you? Let’s understand that hydration doesn’t have to do with just water. Hydration involves a balance of water and electrolytes and it’s surprisingly easy to throw off that balance. Let’s look at some of the ways that are specific to scuba diving. That sweating contributes to dehydration is no surprise. But people don’t often realize how much they’re actually sweating inside their wetsuits. Even if you’re not roasting, if you’re sweating at all outside the suit, you’re sweating all over underneath it. Why? Because the suit doesn’t allow for the body to cool by air evaporation, so it just keeps trying and trying. The longer you have that suit on out of the water, the more water and electrolytes you’re losing due to sweat and you may not even realize it. Try to keep the suit off until right before you’re getting ready to dive. Yes, breathing dehydrates you. It especially dehydrates us as scuba divers. On land, we naturally lose some water during exhalation. Go breathe on a piece of glass if you’re not sure what I mean. That condensation you see is water coming from your body. So if that happens to everyone, why is scuba diving special? Many people don’t realize it, but one of the big jobs the lungs have is to humidify and warm up the air we breathe. The drier that air is, the more our lungs have to work to humidify it and as we all know, compressed air is extremely dry. On top of that, the colder the diving conditions are the more the lungs have to work to warm that same dry air, nearly doubling the effort and moisture loss. So every single breath we take from a compressed air tank, we lose water from our bodies, so much so that nearly a cup can be lost on a 30 minute dive just by the absolutely necessary task of breathing. 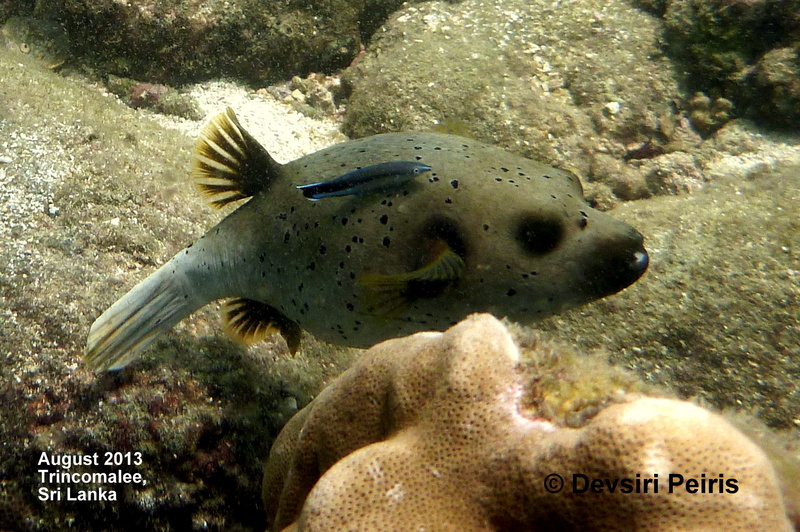 Score one for the rebreathers on this issue because their air is warmer and more moist. If you’re like most people, you’re diving somewhere warm and sunny. And if you’re like most people, you don’t get enough sun normally so you’re probably getting sunburned on your dive vacation. Fluid loss occurs when the skin is burned and the body immediately sends fluid to the skin. The warm sun then evaporates that moisture and fluid is completely lost. Wear sunscreen and keep covered! Chances are the diving you’re doing is in saltwater. The boat ride out to the dive site mists salt onto your skin, then you jump into the salty water, and afterwards you sit around with the dried saltwater on your skin. This water evaporates (thanks to the sun and wind) leaving behind salt crystals that leech the moisture directly out of our skin. Try to rinse off if fresh water is available. Have you noticed that when you’re diving you tend to pee a lot? This may erroneously lead you to believe that you’re well hydrated when that may not actually be the case. When we jump into cooler water, blood is shunted from our limbs to our core in an effort to keep warm. In response to the inevitable increase in blood pressure, the body then starts flushing fluids. In addition to the cold, the water pressure also increases blood pressure, doubling the effect of the cold water. Both of these things directly affect scuba divers and result in divers urinating much more often than they should and losing fluids and salt. Obviously, this is a contributor to dehydration. Whether it’s from sea-sickness or partying, vomiting will severely dehydrate you from direct fluid and electrolyte loss. Try to manage sea-sickness if you can, and continue to try and drink water or sports drinks in between bouts. And even though you may be on vacation, if you’re scuba diving try to minimize your drinking at the very least enough to keep yourself from praying to the porcelain god nightly. Yes, you’re on vacation. But if it’s a dive vacation, drinking should be minimized. I’m not saying you can’t have a couple cocktails once you’re done diving for day, but too much alcohol is a very bad thing when diving. For one thing, alcohol is a diuretic which means it’s going to make you pee more and we’ve already established that can be a bad thing. It also has a lot of sugar in it and when you drink things high in sugar, the body has to dilute them with water. Now we’ve gone over the various ways divers get dehydrated, so how do you know if you are dehydrated? Some symptoms are very obvious, others maybe not so much. The key is just to remain habitually hydrated by drinking normal amounts of water at regular intervals prior to and during your vacation. And yes, water is your best choice. Some sports drinks are good too, but remember they do have high sugar content which can counter some of the hydration you get. The bonus with sports drinks is that they help with replenishing electrolytes. But don’t drink them in place of water, drink them in addition to water. Energy drinks contain a lot of sugar and caffeine, both of which are going to act against your hydration efforts, so best to stay away from them. Eating helps with hydration too. If the boat you’re on offers you fruit wedges during the day, eat them because they contain water, vitamins and fructose. Some salty snacks will replenish electrolytes too. Basically, if you do anything that causes fluid loss then you need to replace those fluids. If you get sunburned, you need to drink more water. If you’re drinking a lot of alcohol, you need to avoid Scuba diving. If you’re vomiting, you need to drink more water. Get the idea? I am constantly encouraging divers to drink more hydrating liquids. If you, like many divers, find consuming adequate quantities of water difficult, a good solution is to bring yummy, non-alcholic, caffeine-free beverages along for the trip. Store them in the boat or dive guide’s cooler. Fresh juices, chocolate milk, and packets of powered drink mix all work well. I love the single-serving packets that can be mixed directly into a bottle of water. Beverages that are not great for hydration include coffee, sodas, beer and margaritas. Also remember that while drinking liquids immediately before and after a dive will help a diver’s body to hydrate, it can only do so much. A diver who is habitually dehydrated will not be able to solve the problem by chugging water only when diving, because the body can only absorb so much water at a time. To function at its best, a diver’s body needs to be in a well-hydrated state, have additional fluids available to maintain hydration while diving, and have even more water to replenish itself after a dive. This means that divers should strive to maintain hydration during their entire diving vacation, not only before and after a dive. This is also one of the many reasons that it is an extremely bad idea to dive hung-over. 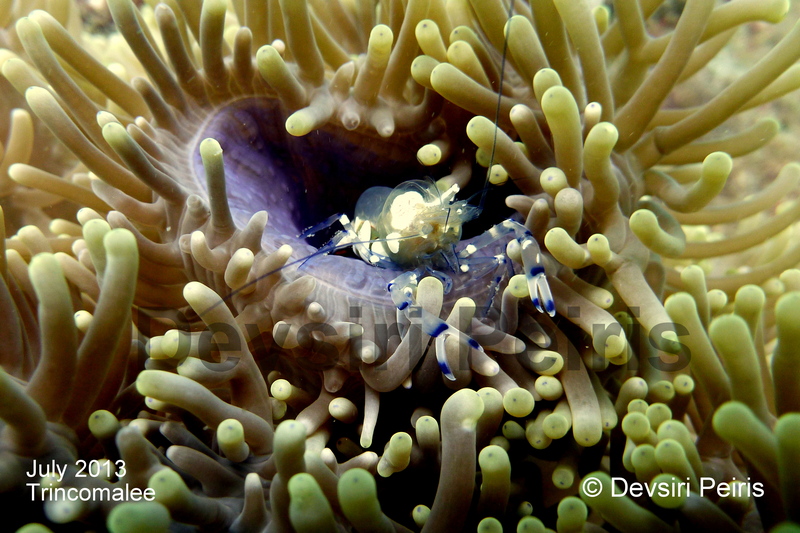 Trincomalee reefs are full of surprises.. amazing amount of healthy corals both soft coral & hard coral, & lots of colorful creatures. 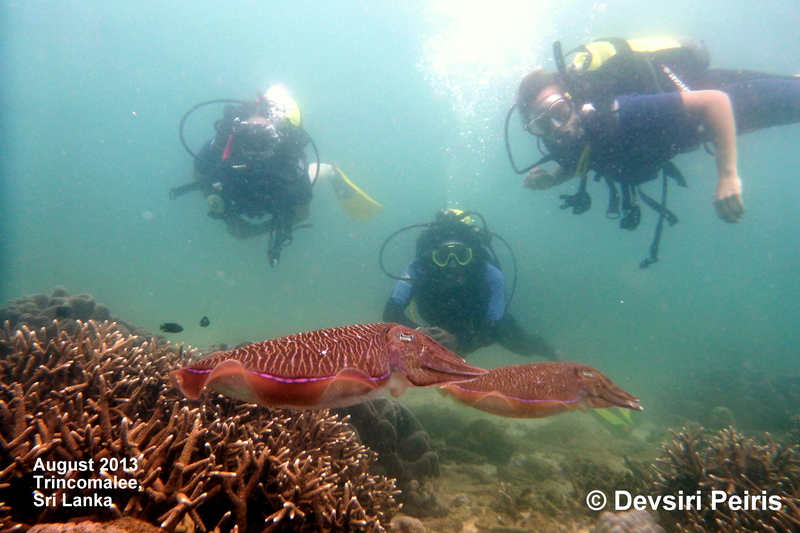 Sampath from Ypsylon dive center in nilaveli with 2 divers watching cuttle fish lay eggs. We all spent approx 15 minits with this pair of cuttle fish, it was a lovely sight.